There are a lot of wedding photographers in Saratoga Springs. 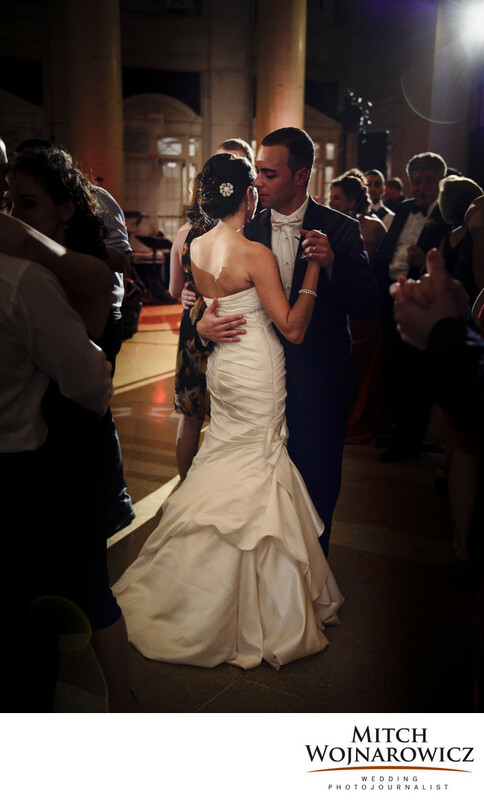 As a top Saratoga wedding photojournalist, my goal is to always look for the wedding moments that tell a story. That have a sense of place. That go beyond the cookie cutter wedding photography that you see from so many people. The best Saratoga wedding photographer will thoroughly cover your Hall of Springs wedding. And they will go beyond that, creating the kinds of photos that help you remember not only how the day looked, but how it felt to you. Let’s talk about this Hall of Springs wedding photo. It’s of a newly married couple enjoying a dance together during their wedding reception at The Hall of Springs. But the photo goes further than the traditional snapshot you will see from so many wedding photographers. First is the mood of the image. I work with carefully planned out external lighting. My lighting is designed to give a feeling for the atmosphere. How many wedding photos do you see that look so bright and light you think they were shot outdoors on a sunny day? How does that help you remember your intimate, candlelit wedding reception? It doesn’t. Look at the mood of this image. You get a feeling for directional light. For the dim, intimate evening reception. For the warmth of the lighting in the environment. Next is the composition. I wanted to show faces, her dress and just a hint of the environment. Not all photos have to be from a "personal distance". And not all have to be super close up. This allowed me to concentrate on the most important thing; the body language, the gesture. Look at the hands, the tilt of the head, the engagement of his face towards her. These are people who are connected. Not just blindly smiling for the camera. Or worse, posing for a photographer who interrupted them to make some traditional wedding photo. Look for wedding photographers in Saratoga Springs who will bring a sensitivity to your wedding day, who know how to guide you, who know how to ask the right questions to help you figure out what it is you want to see in your your wedding photos. Let's Talk about your Hall of Springs wedding!